Not even a broken arm could stop Petty Officer 1st Class Shawn McKinley from volunteering at USO Sasebo on the U.S. naval installation in Japan. With his arm out of commission, he was ordered to take it easy while he recovered, but McKinley knew exactly where he wanted to spend his free time—at USO Sasebo volunteering. He began donating his time to the USO nearly two years ago, becoming a trusted member of the team. While his work demands are constantly changing, McKinley practices “Semper Gumby,” keeping his personal schedule flexible to make time to volunteer whether it’s in the middle of the day or night. McKinley’s collaborative attitude has helped the USO’s staff. His connections came in handy when the USO needed base approval to put new holes in a wall for an art installation. McKinley tracked down the department in charge of approvals and brought the staff member to the USO center to show them what needed to be done. When approval was granted, McKinley installed the artwork himself. 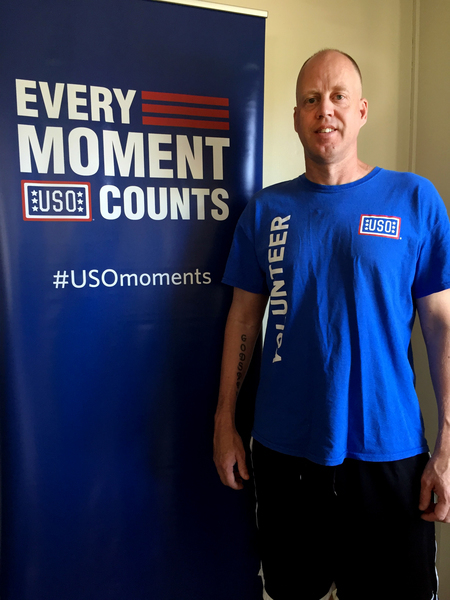 With 669 volunteer hours to his credit, McKinley has proven his dedication to the USO, and he shows no signs of slowing down.